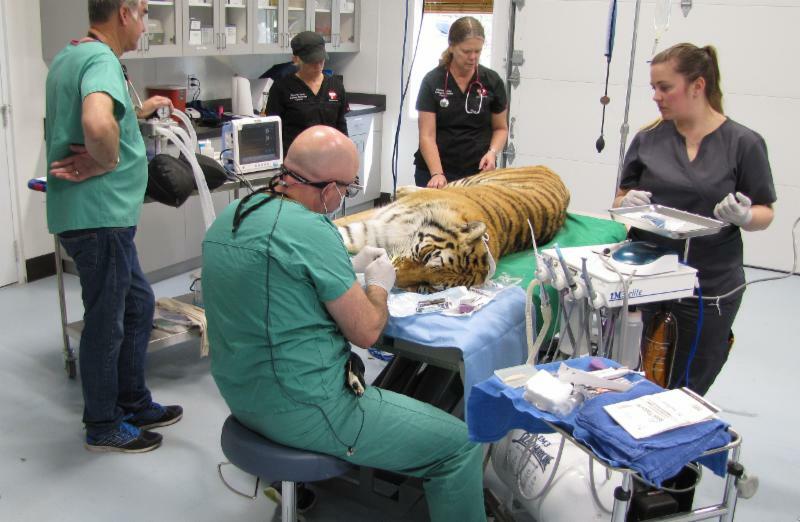 April Newsletter: Rescued tiger Rosemary undergoes second dental procedure; A tribute to Dame Daphne Sheldrick; PAWS' Elephant Grape Stomp fundraiser; and more! Rescue. Advocacy. Sanctuary. For Life. Above: Rescued tiger Rosemary, named in honor of PAWS' board member, the late Rosemary Arnot, recovered quickly from her second dental procedure and is back to her playful self. 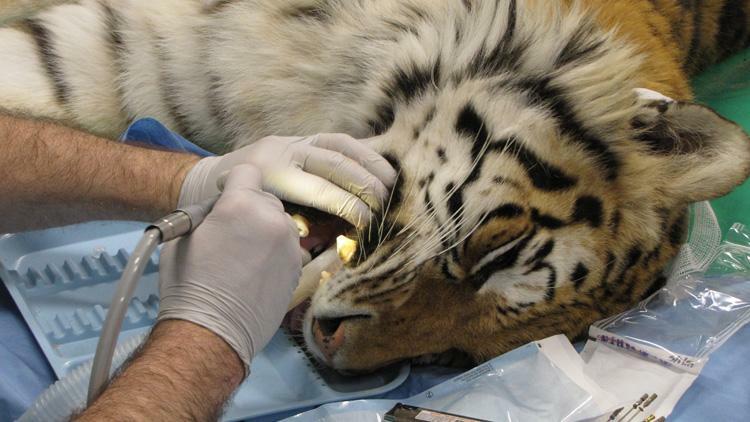 Sometimes tigers need dental work, just like humans. 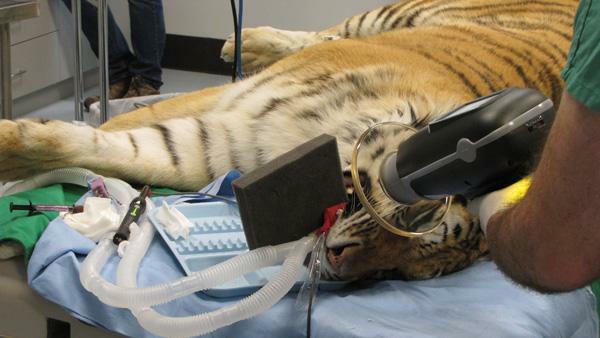 For rescued tiger Rosemary, it was root canals. On March 29, she underwent the second of two successful dental procedures to repair her broken canine teeth. The first procedure took place in late February when veterinary dentist Dr. Nicodin Farcas and his team treated her teeth and prepared them for the actual root canal procedure. It is fairly common to do this in two steps, as the first stage treats exposed vital pulp in order to reduce inflammation and prevent excessive bleeding that may occur when the actual root canal is done. Both procedures took place in the Pat Derby Animal Wellness Center at PAWS' ARK 2000 sanctuary. Dr. Farcas, a board-certified veterinary dental specialist, enthusiastically offered to donate his time and services after PAWS Director of Veterinary Services Dr. Jackie Gai contacted him to discuss treatment options for Rosemary's broken teeth. Dr. Farcas also brought several talented members of his staff to assist him during surgery. Dr. Farcas and his wife, Dr. Amy Farcas, own and operate the Animal Dental Clinic in San Carlos, California, where they care for dogs, cats, and a variety of other species. Dr. Farcas is known for his kind and gentle approach with animals, which has a calming effect on those who might otherwise be fearful or stressed by a visit to the veterinarian. PAWS is proud of the high quality, compassionate care we provide to the deserving animals that live in our sanctuaries. We would like to express our heartfelt gratitude to Dr. Farcas and his assistants, including Practice Manager Stacey Neubert, Registered Veterinary Technician Katie Lopes and Veterinary Assistant Jessica Little. Thanks to Dr. Farcas and team, Rosemary's teeth are no longer causing pain and she is back to her playful self. Dr. Farcas prepares to begin Rosemary's root canal procedure. PAWS' veterinary staff, assisted by volunteer Registered Veterinary Technician Kirk Stafford, monitors anesthesia, administers injections, and collects blood samples while ensuring that Rosemary is safely and comfortably anesthetized. Using our portable Nomad X-ray machine and iM3 digital dental X-ray system, Dr. Farcas takes an X-ray of Rosemary's teeth. These top-of-the-line pieces of veterinary imaging equipment were purchased with funds provided by generous donors to PAWS' veterinary dental program. 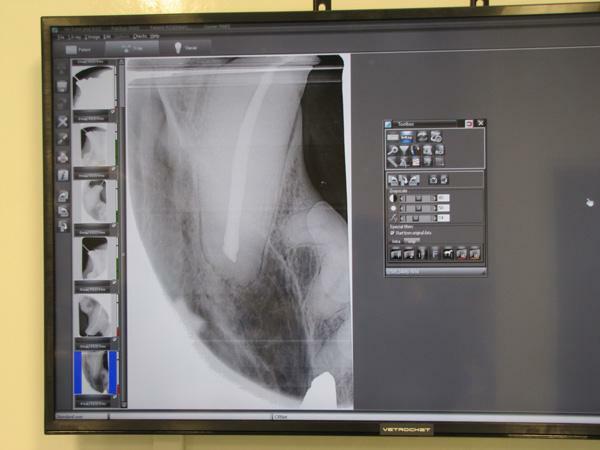 The digital X-ray image of Rosemary's tooth appears on a large wall monitor in the exam room, allowing Dr. Farcas to clearly and instantly monitor the progress of the root canal procedure. Right and below: Dr. Farcas repairs Rosemary's broken canine teeth with a root canal procedure that will eliminate pain and prevent infection. ﻿Countdown to BIG Day of Giving: Help PAWS Raise $30,000 in 24 Hours! The countdown has begun! 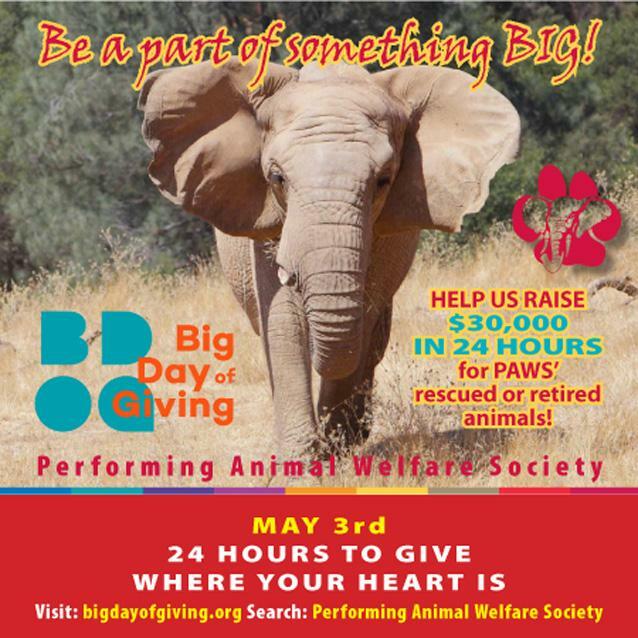 You can help the animals at PAWS by participating in the fifth annual BIG Day of Giving, a 24-hour online giving challenge presented by the Sacramento Region Community Foundation. We invite you to join in the spirit of giving, starting at midnight on May 3rd. 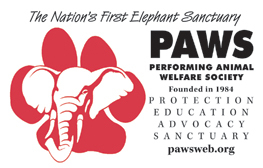 Our goal is to raise $30,000 in 24 hours for the care of the elephants, tigers, bears, monkeys and other wild animals at PAWS. You do not need to live in the Sacramento area to donate. 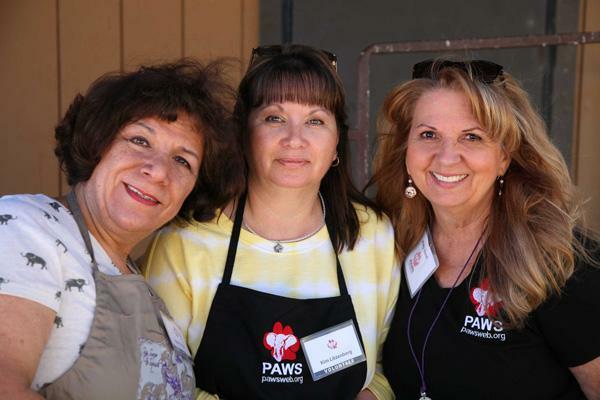 Anyone – an individual or business – can make a gift to PAWS, regardless of where you are located. 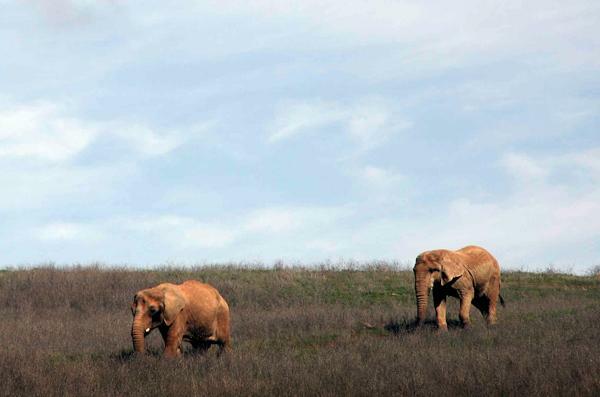 $70,000+ a year ($200 a day) to provide food, daily care and veterinary attention for just one of our 8 elephants. 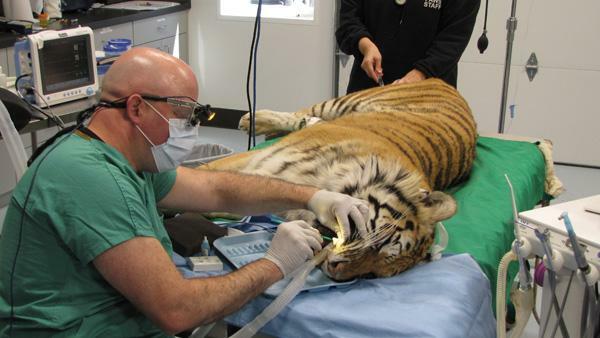 $18,000 a year ($50 a day) to feed and furnish round-the-clock care for one healthy tiger, lion or leopard. PAWS cares for 19 big cats! $15,000 a year ($40 a day) to provide everything that is needed for one healthy bear to thrive. 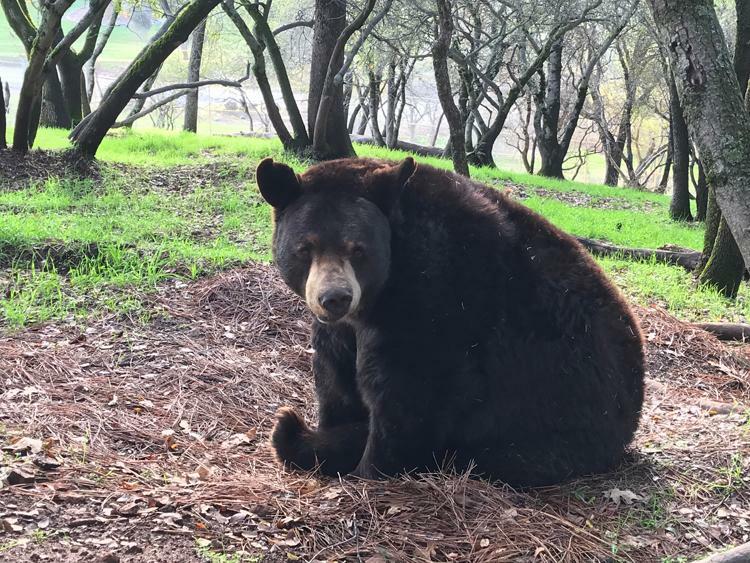 Seven bears have found refuge at PAWS. 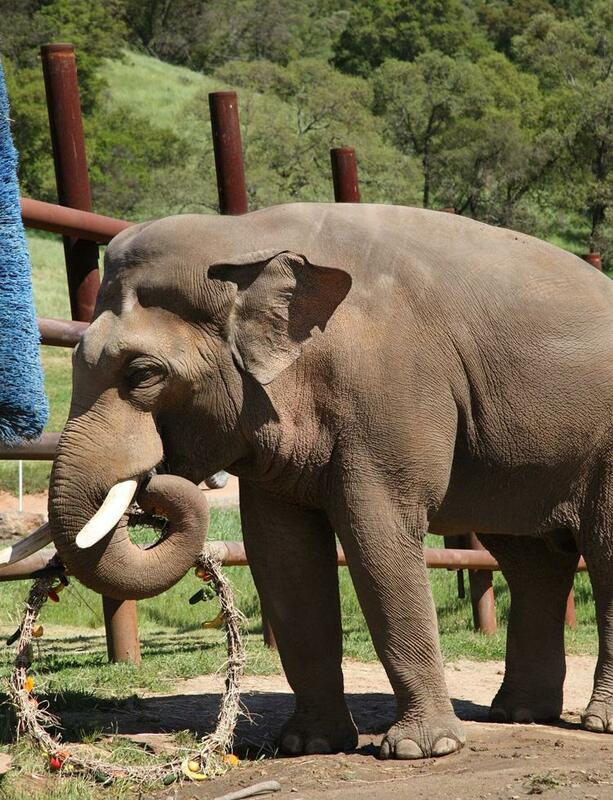 That's more than $1,000,000 a year to care for the healthy elephants, big cats and bears, and the cost goes up considerably for elderly or special needs animals. And PAWS also cares for oryx, emu, Capuchin monkeys, a muntjac deer and a coyote! It’s easy to give! Simply make your online donation (debit or credit) on May 3rd at bigdayofgiving.com . Hourly Donation Challenge: A $500 prize will be awarded every hour to the participating nonprofit that raises the most money during that hour. A total of 24 prizes will be awarded. Hourly Donor Challenge: A $500 prize will be awarded every hour to the participating nonprofit that has the most "unique donors" during that hour. A unique donor is defined as one donation from one donor. Big Day of Giving Boosters: Make a donation with your credit card at bigdayofgiving.org and your donation could get a boost! Each hour randomly selected donations will be given a boost by having additional dollars added to it! Boosts will range from $250 - $1,000! Online giving challenges are most successful when you encourage friends, family and colleagues to also make a donation to PAWS. Please post about the BIG Day of Giving and PAWS on your social media network, and urge others to share as well. Click on the button below to give . Thank you in advance for your generosity to the animals at PAWS! Asian bull elephant Nicholas accepted a tasty edible wreath near the fence of his habitat, his prize for winning the most "votes" in the annual Ms./Mr. TUSKany contest. 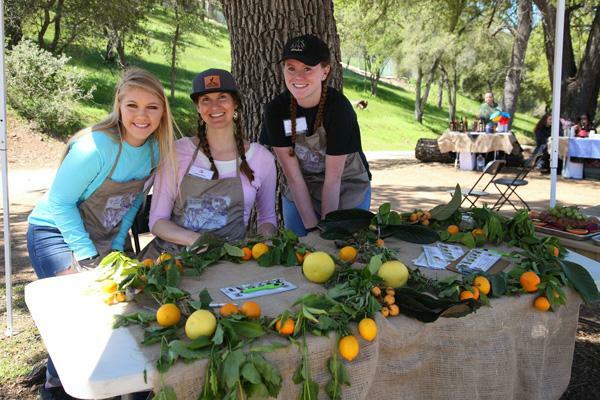 PAWS' Elephant Grape Stomp Fundraiser A Huge Success! 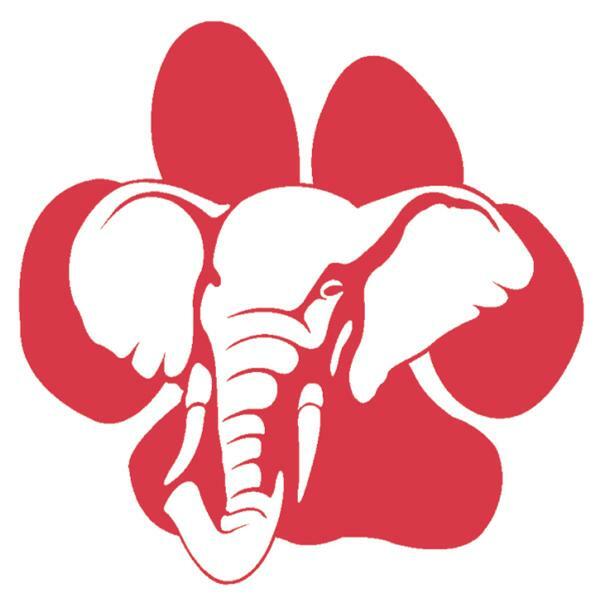 PAWS' popular annual event, The Elephant Grape Stomp: An Afternoon in TUSKany, took place on April 21st. More than 500 guests attended the event, which is held at the ARK 2000 sanctuary in San Andreas. 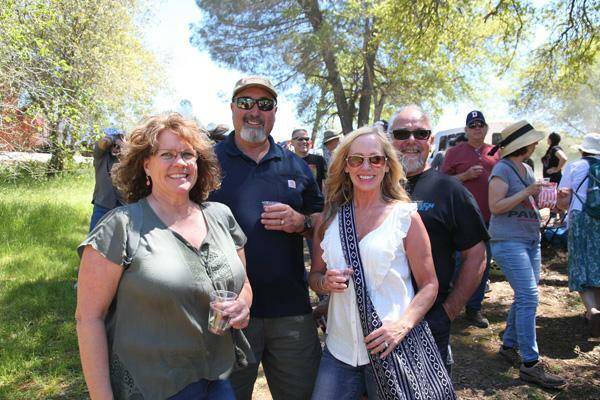 The afternoon raised more than $40,000 in support of PAWS' rescue and animal care programs for captive wildlife in need. 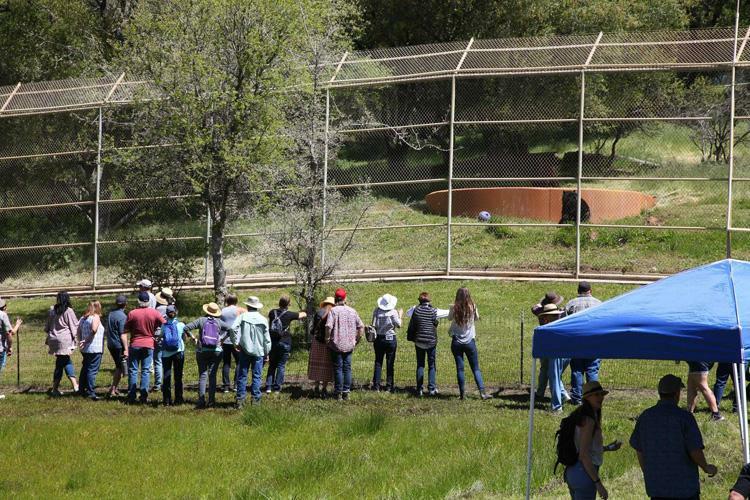 Under sunny blue skies, guests (above, left and below) visited the elephant, bear and big cat habitats, and learned more about the animals’ personal histories. They also heard about the larger issues concerning wildlife, such as the uncontrolled breeding of captive tigers for cub-petting operations and the need to appreciate and conserve animals in the wild. 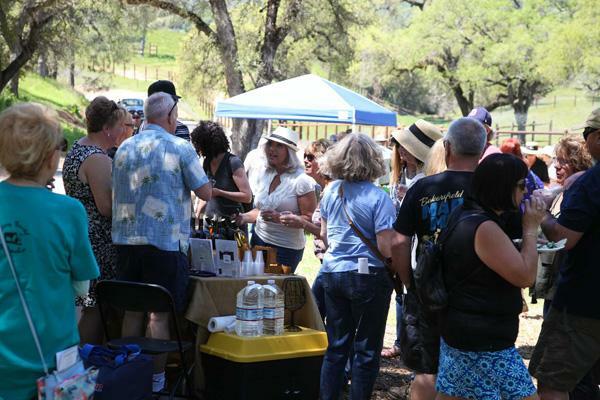 Event attendees sampled a variety of wines courtesy of award-winning California wineries, browsed PAWS' gift shop, bid on silent auction items, and dined on delicious international fare provided by Pivotal Foods, Dos Coyotes, Miyoko's Kitchen and Aji Japanese Bistro. Guests gather near the Bob Barker Bear Habitat to listen while PAWS' keepers talk about black bears Boo Boo and Winston. 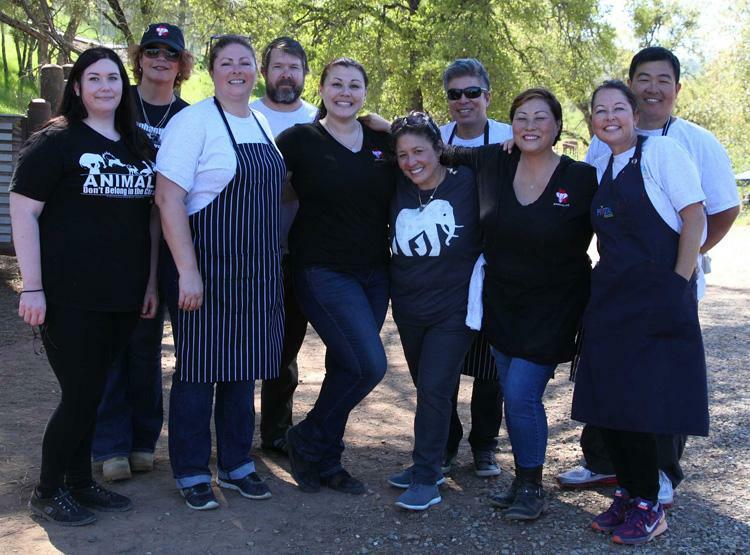 Executive Chef M.J. Espiritu Gerometta (wearing the elephant t-shirt) from Pivotal Foods with her Elephant Grape Stomp culinary crew. 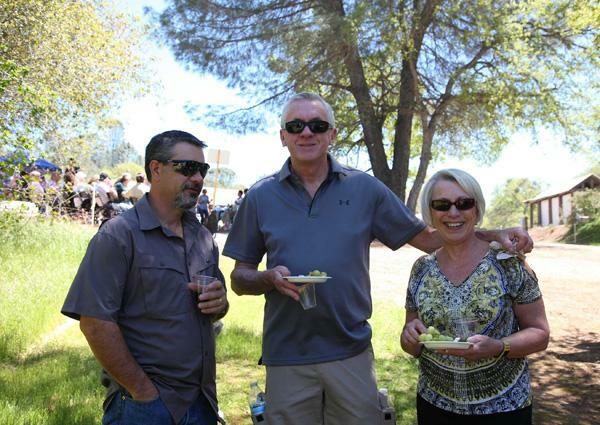 Jeff Newland and servers from Dos Coyotes. 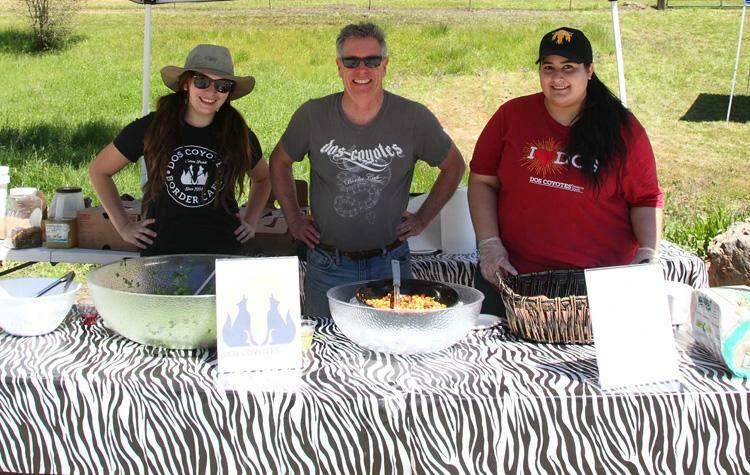 Jeff has been donating delectable cuisine to PAWS' events for 20 years! Laura McGavern with the beautiful elephant quilt she made and raffled, raising over $1900 for PAWS' elephants. Congratulations to raffle winner Richard Leffingwell of Alamo, California! 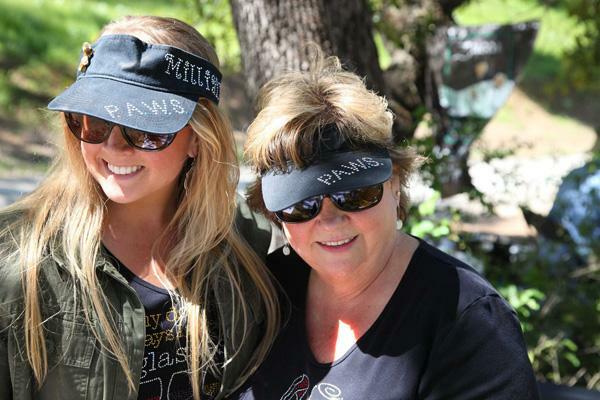 Everyone loved the "PAWS" visors worn by wine servers from Milliaire, the oldest family-owned winery in Murphys, California. 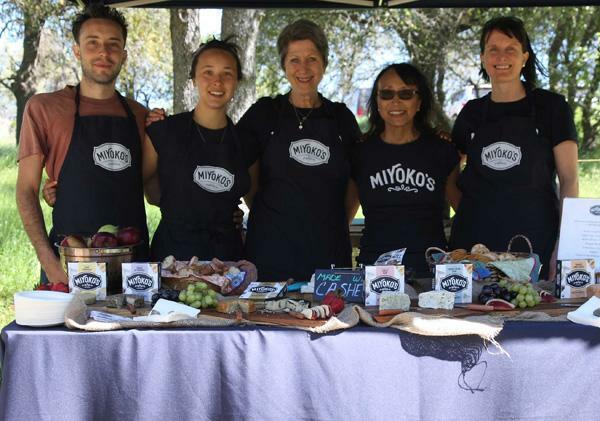 Elephant Grape Stomp attendees were treated to fabulous plant-based cheese tasting courtesy of Chef Miyoko Schinner (second from the right), owner of Miyoko's Kitchen, and her staff. Chef M.J. Espiritu Gerometta and Pivotal Foods , Jeff Newland and Dos Coyotes , Chef Miyoko Schinner and Miyoko's Kitchen, and Chef Russell Okubo and Aji Japanese Bistro . The wineries who so generously offered their wines for tasting: Black Sheep Winery, Bodega del Sur Winery, Brice Station Vineyard, Broll Mountain, Irish Family Vineyards, Ironstone Vineyards, Jada Vineyards, Michael David Winery, Milliaire Winery, Renegade, Stevenot, Twisted Oak Vineyards, Val Du Vino, Vina Moda, Wilderotter Vineyard, Zucca Mountain Vineyards. Cindy Anderson and Rachel Silva for once again tempting our guests with delicious baked goods. 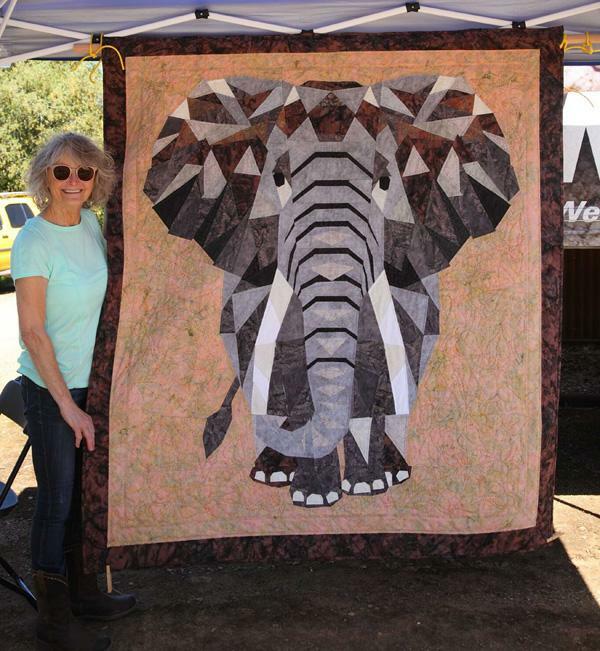 Laura McGavren for raffling her beautiful elephant quilt to benefit PAWS' elephants. Auction Chair Dr. Kristina Wiley and her wonderful team. All of our silent auction donors, including Kim Basinger, Kevin Nealon, Dr. Kristina Wiley, Ed Stewart, Miyoko's Kitchen, Big Trees State Park, Debbie Casey, Lonnie Jones, and Courtwood Inn Murphys. MaryAnne Garamendi , Mountain Oaks School families , and the San Andreas Rotary for helping us set up tables, chairs and tents for the event, and for helping us take everything down after it ended. PAWS volunteers , many of whom have been with us for more than a decade and without whom we could not have presented this important event: Janet Aamodt and Tim Aamodt, Cindy Klein Anderson, Karen Anderson, Sylvia Arispe, Misty Baron, Priscilla Chalmers, Chris Christensen and Marcie Christensen, Nancy Dixon, Linda Dodge, M.J. Espiritu Gerometta, Kelly Napoli-Floto, Matt Floto, Nick Fredrick, Christine Gardner, Barry Gardner, Rhianna Gardner, Kitty Good, Diane Harpainter, Joey Harvey, Galen Hazelhofer, Dr. Barbara Hodges, Gordon Holmes, Ruth Huffman, Michelle and Olivia Humphreys, Kim Jackson, Jerry Jacobs, Cheryl Jensen, Lonnie Jones, Janelle Kessler, Denise Lain, Leilani Lagge, Becky Lanier, Barbara Larkin, Diana Larson, Nanci LaRue, Kim Litzenberg, Stacey Lyons, Stephanie Marohn, Jill and Mike Mason, Ashley Merz, Bonnie Morgan, Lorrie Morris, Lisa Munoz, Sharon Niel, Jeff Newland, Steve Petty, Kendra Powell, Jane Richter, Judy Sheeley, Rachel Silva, Lynn Small, Monica Smith, Nancy Stehura, David and Lori Swearingen, Sarah Swift, Haley Walker, Donna and Bob Wilhelm, Kerry Worgan and Dale Zehung. On behalf of PAWS' Board of Directors, including Katia Bagatta, Carol Haft, Kevin McCourt, Ed Minghelli, Debbie Morrow, Steve Pape and Ed Stewart, we would like to thank everyone who attended and supported this year's Elephant Grape Stomp! 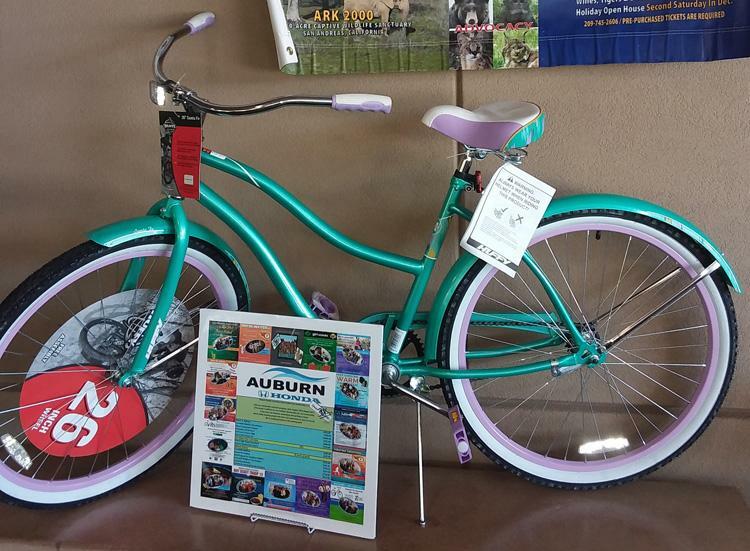 PAWS' management and staff sincerely thank Auburn Honda in Auburn, Calif., for holding its third annual bicycle raffle to benefit the animals at our three sanctuaries. Tickets for the raffle were sold at our March 10th Open House at ARK 2000 and at the dealership. This event raised nearly $400 for the animals, and the lucky winner was Mikki Budrow! Special thanks to PAWS board member Carol Haft who sold raffle tickets at the dealership along with PAWS' friend Pam Sinning. We would also like to thank: Auburn Honda General Manager David Jones for his generosity and continued support; Auburn Honda Service Department Coordinator and Customer Relations Representative Leanne Price for arranging this event; and event cook Zach Bennett. 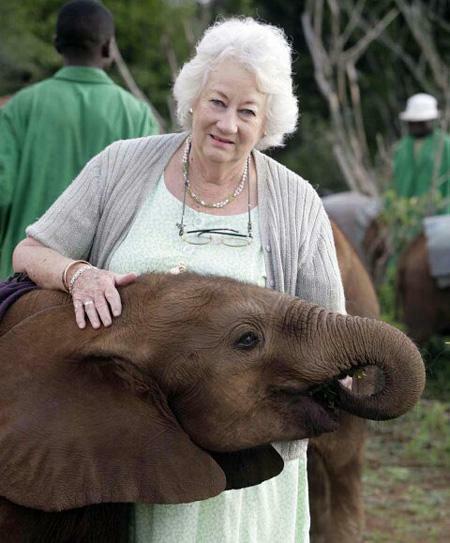 Prominent conservationist, Dame Daphne Sheldrick, 83, passed away on April 12th after a long battle with cancer. She was the founder of the David Sheldrick Wildlife Trust elephant orphanage in Kenya, which rehabilitates and cares for orphaned elephant calves for eventual release back to the wild. Dame Sheldrick was known internationally for her work, including being the first person to successfully hand-raise a milk dependent newborn elephant and rhino. PAWS was fortunate to work with Dame Sheldrick, who also stood up for captive elephants, speaking out many times on their behalf. She often endorsed PAWS’ elephant welfare campaigns, and after PAWS rescued baby African elephant “71” in the 1980s, PAWS co-founder, the late Pat Derby, corresponded with Dame Sheldrick for advice about the sickly calf. PAWS urges everyone to continue to support the David Sheldrick Wildlife Trust, whose critical work for elephants is needed now more than ever. Tickets are now on sale for our next ARK 2000 Open House to be held on Saturday, May 12th, from 11 a.m. to 2 p.m. Prices are $50 for adults, $35 for seniors (65 and over) and $25 for children (age 12 and under). No tickets will be sold at the gate on the day of the event and these events do sell out. Visitors to the ARK 2000 Open House will board shuttles to the bear, big cats and elephant habitats. Once you exit the shuttle you will be doing a lot of walking — on grass, dirt, gravel, and sometimes paved surfaces — so please wear comfortable shoes. PAWS management, keepers and volunteers will be on hand to tell you about the animals and answer questions. A gift shop will be available on the day of the event. We accept cash, checks and all major credit cards. This event happens rain or shine. Tickets are not refundable. Two ways to purchase: Click here to buy online and print your tickets at home; or call 209-745-2606, Monday-Friday, 9 a.m. to 4:30 p.m. PST, to charge by phone. Visit our calendar of events page for more information. Ticket sales close on Thursday, May 10th, or earlier if this event sells out. The ARK 2000 sanctuary is not open to the public . We schedule only a limited number of educational events throughout the year. Our next ARK 2000 Open House will be held on December 8th. Tickets will go on sale approximately 60 days prior to the event. Check our Calendar of Events for more information. Azadeh and Craig Morrison: one 10 lb. tub of Psyllium. Claire Osborne: one 24" heavy duty Boomer Ball for the tigers. Carol Haft: one bottle of Emcelle Tocopherol, 1000 ml. Valerie Marini: one 10 lb. bag of Missing Link Ultimate Skin & Coat. Patricia L Connelly: two 5 lb. tubs of Psyllium. Jeff Libby: one gallon of Red Cell. Beverly Archer: two boxes of 13 gallon trash bags. Debbie Larkin: one 24" heavy duty Boomer Ball for the tigers. Peggy Buckner: one 10 lb. tub of Psyllium. Joyce E. Hodel: one 20 lb. tub of Psyllium; two gallons of Red Cell; one 10 lb. bag of Missing Link Ultimate Skin and Coat; one pkg AA Batteries, 100#. Caroline Kane: one gallon Red Cell; one 10 lb. bag of Missing Linked Ultimate Skin and Coat; six Probiocin Oral Gel. Cynthia Smith: one 20 lb. tub of Psyllium; eight Probiocin Oral Gels; one 30 lb. bag of Blue Protection Formula. Nancy Gordon: two 6 ft. folding tables for ARK 2000. Chrystal M Cowdrey: one 5 lb. tub of Psyllium; one gallon of Red Cell. Lisa Thew: two Probiocin Oral Gels. Lisa Thew and Kelley Ogden: one 5 lb. tub of Psyllium; one pkg. AA batteries, 100#. Anonymous Donors: one case of copy paper; 14 gallons of bleach; one gallon of Red Cell. but not listed on the Amazon list, here . 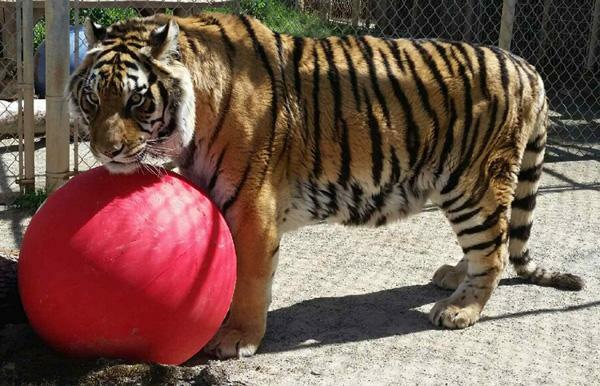 ﻿Rescued tiger Zeus, pictured in his den area, with his new 24" heavy duty Boomer Ball, a gift from a generous donor who visited PAWS' Amazon Wish List. Zeus, who will turn 16 next month, has arthritis and neurological problems related to a history of confinement and inadequate nutrition before coming to PAWS. Today he receives a nutritious diet, as well as medications and supplements to keep him comfortable. 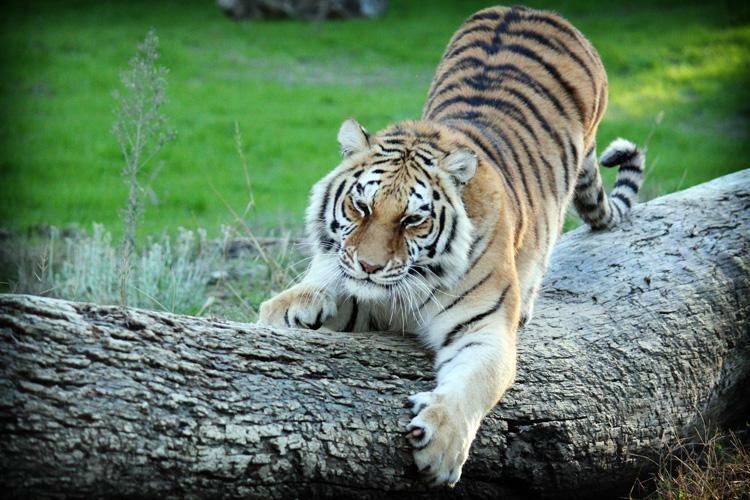 All of the tigers at PAWS have access to large, natural areas with trees, thick vegetation, grass, soft soil, pools and shady spots for napping. This ball, specially designed for large animals, provides a form of physical therapy by encouraging Zeus to stretch, play and use his muscles, whether in his den or out in the habitat. Give to one of PAWS' special ongoing fundraisers: the "Dollars for Dirt" campaign for PAWS' elephants, or the "Support a Rescued Tiger" campaign to benefit the 17 rescued tigers living at our ARK 2000 sanctuary. 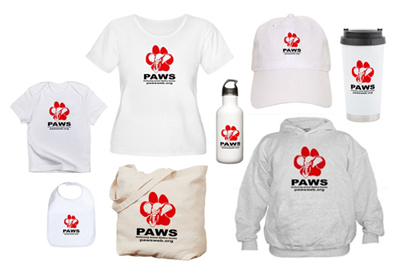 Purchase PAWS apparel and merchandise. Clothing for adults, kids, toddlers and infants, as well as other fun merchandise like coffee mugs - available from our online gift shop . PAWS Amazon Wish List. View here , and shop using AmazonSmile . EBAY Giving Works. List items on EBAY and choose PAWS as your charity. Donate a percentage of each sale to the animals. Visit our EBAY charity listing page here . Start selling! Corporate Donations and Matching Fund Programs. Learn more about what is needed. Donate Your Vehicle To PAWS. Attend A Fundraiser. PAWS sanctuaries ARE NOT OPEN TO THE PUBLIC but we do schedule a limited number of special events throughout the year. Click here to view PAWS' Calendar of Events. 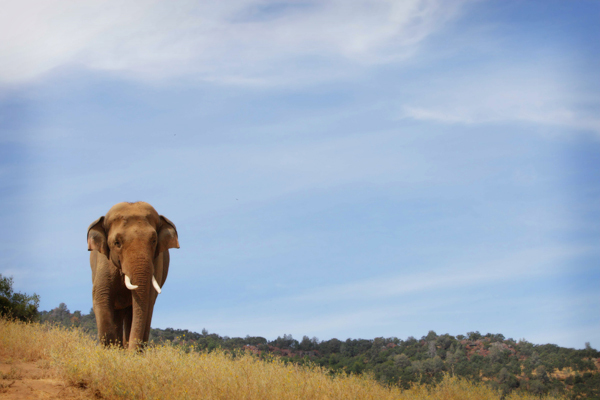 PAWS provides lifetime care to the tigers, bears, elephants, and other animals that call our sanctuaries home. As animals age, their needs change and they may develop arthritis, kidney disease, and other conditions that are readily treatable with proper care. PAWS expert animal care and veterinary staff provide specialized nutritional and medical support, tailored to the individual needs of each animal. Your generous donations make this excellent care possible.